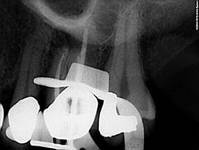 Below are some cases that I found interesting in one way or another. I will periodically add cases as they come. 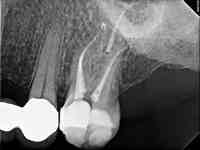 These are the cases that make endodontics interesting and challenging! 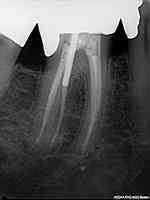 Tooth #19- Irreversible pulpitis due to cusp fracture. 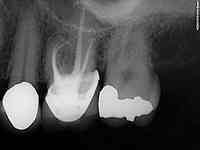 Bottom right x-ray is a one year follow up after final restoration. 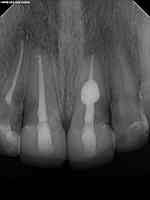 Tooth #3- Previous RCT with acute apical abscess. Pt presented with swelling and fever. 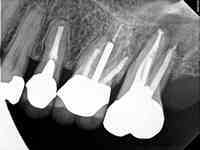 A large post and gutta percha carriers were removed. 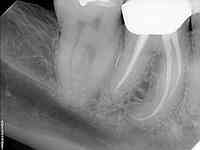 Missed MB2 canal was located and instrumented. 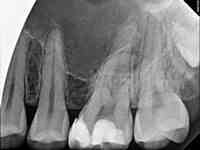 Calcium hydoxide dressing was packed in the tooth for one week. Final film (bottom left) and one year check (bottom right). One year check shows excellent healing. 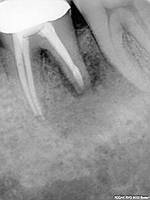 Tooth #14-Irreversible pulpitis. 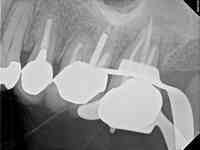 4 calcified canals treated with difficult anatomy in the 2 MB canals. 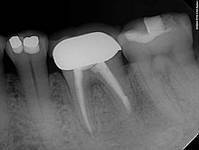 Tooth #14- Necrotic Pulp with Symptomatic Apical Periodontitis. 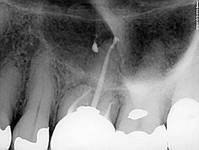 Note the deep toothbrush abrasion causing calcification of the buccal canals. 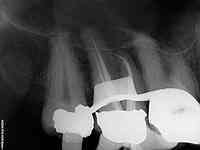 Final xray is a one year follow up showing excellent healing. 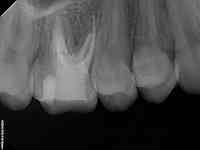 Tooth #30- Irreversible Pulpitis with acute apical periodontitis. 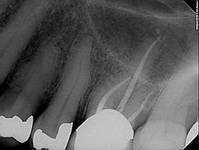 Very long, curved, mesial root. 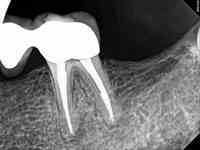 The working lengths for the mesial canals were 28mm. 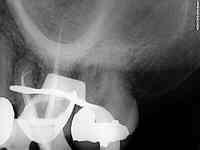 Final xray shows one year check. 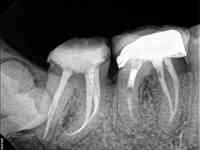 Teeth #8 and #9. Hx of trauma. 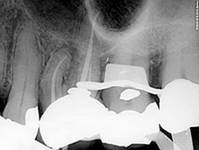 #8 is necrotic while #9 is vital with advanced internal resorption defect. 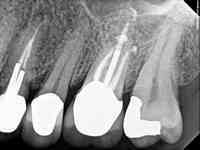 Bottom left xray is the post op and the bottom right is a one year follow up. 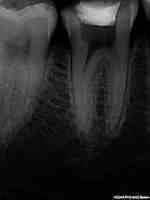 Tooth #30. 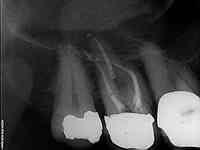 Deeply fractured ML cusp. 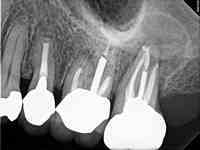 RCT and post buildup completed. 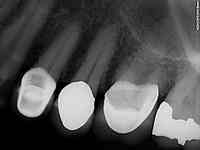 Bottom right x-ray is a one year follow up. 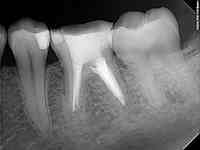 Tooth #3- Irreversible pulpitis. 4 canals sealed 2 MB canals join. 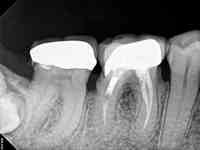 Lower left film is the final and the bottom right film is the one year follow up. 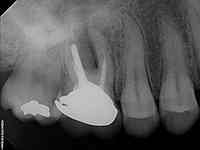 Retreatment of tooth #14. 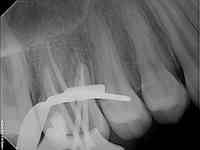 Large post and silver points removed. 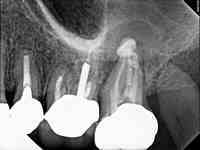 Located missed MB2 and sealed all canals and completed post build up. 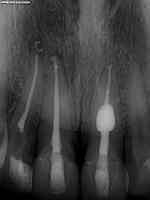 Lower right film is a one year follow up showing excellent healing of PA lesion over the MB root. 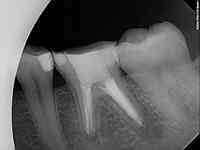 Tooth #30 with separated instrument in the distal. 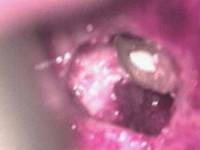 Retreatment was previously completed but lesion lesion and symptoms persist. 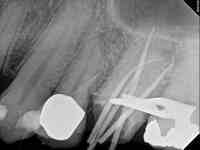 Apicoectomy and retrofill with MTA performed on the distal root. Microphotograph shows the final MTA fill. 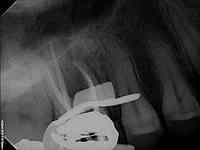 Final xray in the lower left. 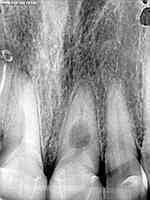 The lower right film reveals excellent healing after one year. 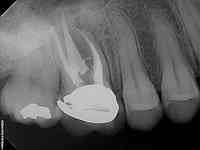 Tooth #19 (or perhaps retained deciduous molar) with a broken instrument pushed out the distal root apex. 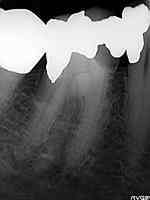 The file was removed using files under the microscope. The lower left film is the final. The lower right film is a one year check. 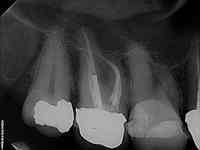 The lesion over the distal root has completely healed even though the patient still hadn't had the tooth restored. 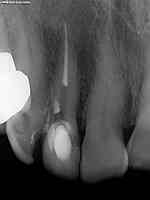 Tooth #3 was necrotic with extensive apical resorption. 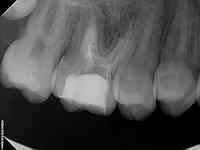 Pt was 13 years old and despite the guarded prognosis, we recommended trying to save this tooth due to her age. 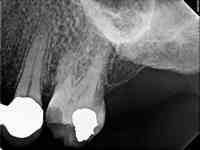 The 2nd and 3rd films are calcium hydroxide visits. 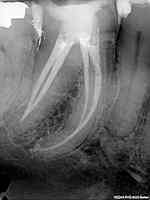 The palatal root was packed with MTA and the MB1,MB2, and DB roots filled with gutta percha/sealer. Bottom left film is the final. Bottom right film is a one year check showing excellent healing. 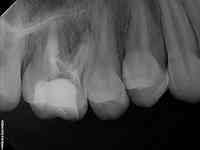 Calcified tooth #7 had been started and perforated in the distal aspect. 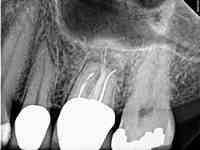 The perforation was sealed with MTA and the canal located and sealed. Bottom right film is the one year check after final restoration. 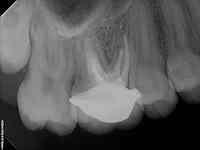 Tooth #14 with acute apical periodontitis. Silver points had been used to seal the case in the 1970's. 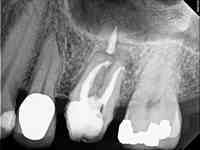 The crown was removed to facilitate the removal of the silver points. 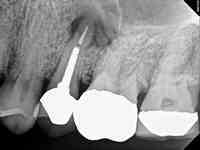 Note that the silver point in the MB root is actually 2 pieces, with a fragment at the apex. 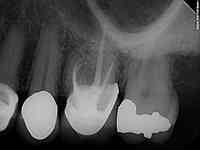 Both were removed, MB2 located, and all 4 canals sealed. 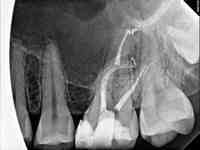 I would always treat this case with calcium hydroxide as an interim canal medicament but this very phobic patient was sedated for the procedure so the case was completed in one visit. 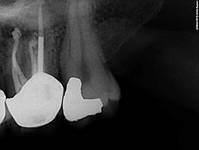 Tooth #31- Irreversible pulpitis due to decay under the lingual margin of the crown. 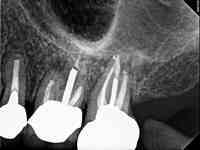 The crown was sectioned prior to treatment. 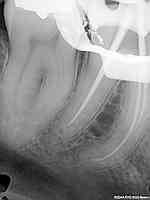 The mesial canals were quite curved. 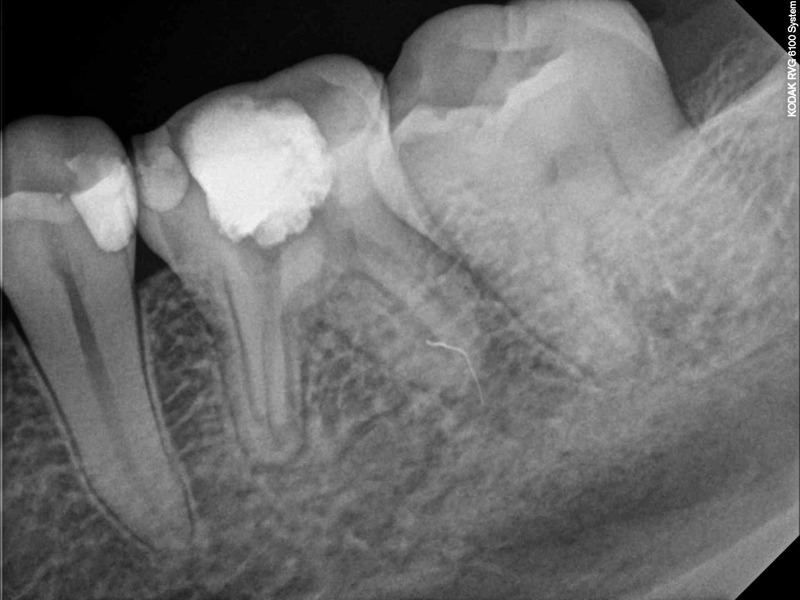 Tooth #14- Necrotic with symptomatic apical periodontitis. 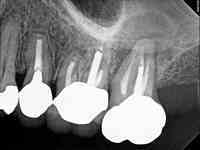 Four canals were sealed and post space prepped. 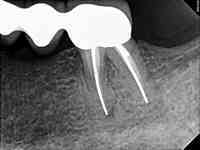 The two mesial canals joined at the midroot. 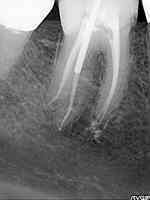 Tooth #19-Previously endo treated with silver points in the 1970's and retreatment was attempted in the late 1980's but silver points could not be removed. 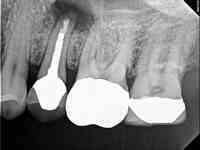 Post and remaining silver points were removed. 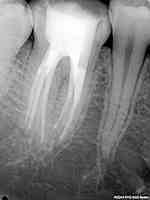 The tooth was packed with calcium hydroxide for 2 weeks, and and sealed. 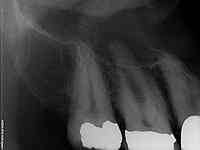 Pt will return to his general dentist for post buildup. 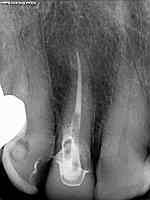 Tooth #30- Her general dentist had performed open and med to relieve pain. 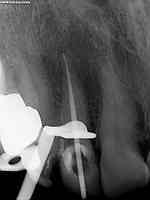 He encountered bleeding from the distal root orifice and suspected a perforation. Exploration under the microscope reveals 5 separate canals. 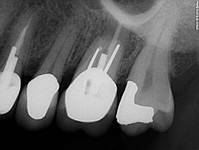 RCT is complete and the tooth built up with bonded composite. 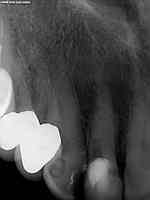 Tooth #14- Necrosis with acute apical periodontitis. 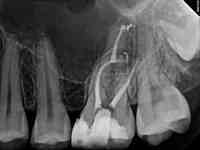 Acutely curved MB root had MB1 and MB2 canals. 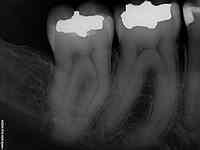 MB canals were completely separate and did not join in this case but it was difficult to split the MB canals in the xrays. 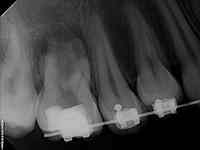 RCT #15 had been treated many years ago and pt presented with pain to biting and extensive tooth mobility. 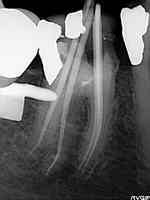 I advised of guarded/poor prognosis due to extensive bone loss. 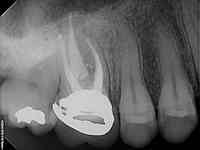 The post and carriers were removed and the tooth packed with calcium hydroxide. 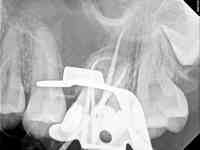 The top right picture is the calcium hydroxide xray with material extruded out the palatal canal. 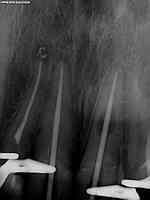 Four weeks later, Retreament and post buildup were completed (bottom left xray). 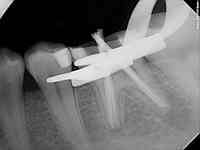 One year xray reveals excellent healing of the lesion. 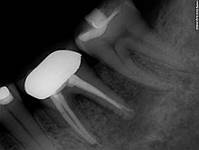 The tooth exhibits normal mobility and is pain free.